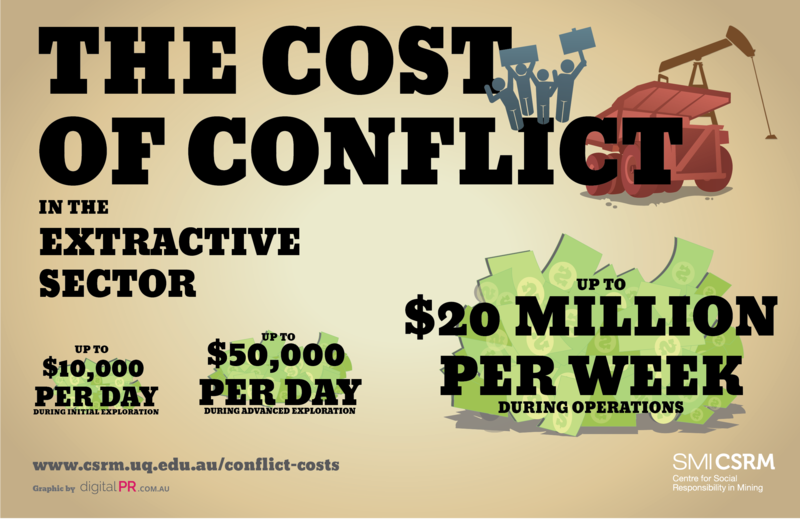 The Centre for Social Responsibility in Mining at The University of Queensland (UQ), and the Harvard Kennedy School have published new research that has uncovered the true scale of the costs companies incur when they come into conflict with local communities. The research interviewed professionals in the mining, oil and gas industries and examined case studies of extraction projects worldwide to quantify the costs of company-community conflict, and understand how companies interpret these costs. Dr Daniel Franks, Deputy Director of UQ’s Centre for Social Responsibility in Mining (CSRM), said that in the mining, oil and gas industries conflict has become a major contributor to cost of projects with a series of the industries’ flagship projects abandoned or delayed in the face of community opposition. “There is a popular misconception that local communities are powerless in the face of large corporations and governments,” said Dr Franks. “Our findings show that community mobilization can be very effective at raising the costs to companies”. The research revealed that delays caused by conflict with communities can incur costs of roughly US$20 million per week for mining projects valued between US$3 and US$5 billion. Analysis by one company of their exposure to non-technical risks revealed US$6 billion in costs over a 2-year period, representing a double-digit percentage of the company’s annual operating profits. “The cost-cutting currently underway in the mining, oil and gas industries seems to be missing the potential opportunities for cost savings that can come from investing in improved relationships with communities”, said Dr Franks. Rachel Davis, a Fellow at the Corporate Social Responsibility Initiative at Harvard Kennedy School, and Managing Director of the non-profit business and human rights organisation, Shift, said that “It is much harder for a company to repair its relationship with a local community after it has broken down; relationships cannot be ‘retro-fitted’”. “Companies are realizing that conflict is predictable, and so are the systems needed to prevent it. That’s why we see leading companies implementing the UN Guiding Principles on Business and Human Rights – to manage their human rights risks more effectively,” she said. “Increasingly, financial actors are also beginning to factor in the prospect of delays in valuations of projects,” said Ms Davis. An economy wide valuation of ‘environmental, social and governance risks’ across the Australian Stock Market in 2012 by Credit Suisse identified AUS$21.4 billion in negative share price valuation impact, with mining and hydrocarbon the sectors at greatest risk (AUS$8.4 billion; and an average of 2.2% impact on the target share price). The research was published as an expanded report for the Corporate Social Responsibility Initiative of the Harvard Kennedy School (by Rachel Davis and Daniel Franks), and as an academic paper in the Proceedings of the National Academy of Sciences (by Daniel Franks, Rachel Davis, Anthony Bebbington, Saleem Ali, Deanna Kemp and Martin Scurrah). Stakeholder-related risks in the extractive sector have risen rapidly over the last two decades. Time and again, companies have experienced how negative environmental impacts – such as a spill from a tailings dam – can generate significant negative social impacts as well, for example on local community health and livelihoods. Local communities’ reactions to these impacts can quickly escalate from complaints to protests and road blockades, raising the risks of the company or its security providers using heavy handed tactics that can lead to even more serious impacts, such as injury or even deaths. This all too- familiar situation has significant costs – for the community of course, but also for extractive companies themselves. Davis, Rachel and Daniel M. Franks. 2014. “Costs of Company-Community Conflict in the Extractive Sector.” Corporate Social Responsibility Initiative Report No. 66. Cambridge, MA: Harvard Kennedy School. ← Monbiot: Drilling in Virunga does not end our hunger for resources, it exacerbates it!